St. Cecilia: Arioso. Father, whose blessing we entreat. The holy city: Aria. Eye hath not seen. Ruth: Recit. Now go your ways, my daughters well-beloved. Aria. O gracious Lord, cast down thine eyes. Athalia: Recit. O Judah, Judah! chosen seed! Aria. O lord, whom we adore. Deborah: Recit. Great prophetess! my soul’s on fire. Aria. In the battle, fame pursuing. Hercules: Aria. The smiling hours, a joyful train. Israel in Egypt: Aria. Thou shalt bring them in. Joshua: Recit. But who is this? tremendous to behold. Aria. Awful, pleasing being, say. Recit. Now give the army breath. Aria. Heroes, when with glory burning. Judas Maccabæus: Father of heav’n! from thy eternal throne. The messiah: Recit. Behold, a virgin shall conceive. Aria. O thou that tellest good tidings to Zion. Aria. He was despised and rejected. Samson: Aria. Return, o god of hosts. Solomon: Aria. What tho’ I trace each herb and flower. Susanna: Recit. A love like mine, so faithful. Aria. When first I saw my lovely maid. Christus: Arioso. He was oppress’d and afflicted solo. Elijah: Aria. O rest in the lord. Christmas oratorio: Aria. Patiently have I waited for the lord. The holy city: Aria. My soul is athirst for God. Aria. To the lord our God belong mercies. Athalia: Recit. Great queen, be calm. Aria. Gentle airs, melodious strains. Hercules: Aria. From celestial seats descending. Jephtha: Recit. Deeper and deeper still. Aria. Waft her, angels, thro’ the skies. Judas Maccabæus: Recit. My arms! against this Gorgias I will go. Aria. Sound an alarm! Messiah: Recit. Comfort ye, my people. Aria. Ev’ry valley shall be exalted. Recit. He that dwelleth in heaven. Aria. Thou shalt break them with a rod of iron. 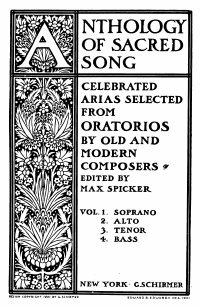 Occasional oratorio: Aria. Jehovah! to my words give ear. Samson: Recit. Oh, loss of sight! Aria. Total eclipse! no sun, no moon. Recit. My grief for this forbids mine eyes to close. Aria. Why does the God of Israel sleep? The creation: Recit. And God created man. Aria. In native worth and honour clad. Elijah: Recit. Ye people, rend your hearts. Aria. If with all your hearts ye truly seek me. Aria. Then shall the righteous shine forth. Hymn of praise: Recit. Sing ye praise, all ye redeemed. Aria. He counteth all your sorrows. The light of the world: Aria. Refrain thy voice from weeping. Deborah: Aria. Tears, such as tender fathers shed. Judas Maccabæus: Recit. I feel the deity within. Aria. Arm, ye brave! The messiah: Recit. Thus saith the lord. Aria. But who may abide. Recit. For behold, darkness shall cover. Aria. The people that walked in darkness. Aria. Why do the nations. Recit. Behold, I tell you a mystery. Aria. The trumpet shall sound. Occasional oratorio: Recit. Humbled with fear. Aria. His sceptre is the rod of righteousness. The passion: Aria. My father, look upon my anguish. The creation: Recit. And God said, let the waters. Aria. Rolling in foamless billows. Recit. And God said, let the earth. Aria. Now heav’n in fullest glory. The destruction of Jerusalem: Recit and Aria. Jeremiah’s lament. Elijah: Recit. Draw near, all ye people. Aria. Lord God of Abraham. Aria. Is not his word like a fire? Aria. it is enough.